Drivers will benefit from £106 million of investment on the M5 in the South West over the next few months. Between now and the end of April 2015, the Highways Agency will complete a major programme of work on the M5 that has resulted in a £77 million investment in maintenance and a further £29 million investment on improvements over the past 12 months. The M5 is a major route into the South West and the investments we are making will bring big benefits for people and businesses across the region. We are delivering five pinch point schemes on the M5 in the South West which will support the region’s economy by easing congestion and making journey times more reliable. All of these schemes are currently under construction and will deliver much needed support for jobs, housing and the overall competitiveness of the region. Our maintenance investment includes an £18 million program of repairs on three motorway bridges along the M5 motorway in Gloucester and a further £5.4 million on joint replacement and waterproofing at the M5 Huntsworth Viaduct near Bridgewater. By the end of March we will have invested a further £3 million in resurfacing a further 20 miles of lanes in addition to the 124 lane miles we have already delivered since April 2014. I know that road works mean disruption but we always do all we can to deliver these vital improvements in a way that keeps traffic moving as much as possible – and the result will be an improved, smoother, more reliable and safer road network. From April, the Highways Agency is set to become Highways England, a government owned company with fixed five year funding and the promise of the biggest investment in roads since the 1970s. In December, the Government announced details of 127 national road projects, seven of which are in South West England – up to £2 billion of investment for the region. In addition, there has been a commitment to on-going maintenance on the network, with increased funding for activities like road resurfacing and lighting renewals. 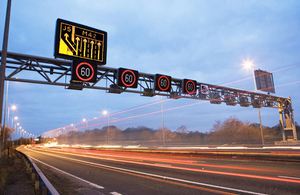 Pinch point schemes taking place on the M5 include two in South Gloucestershire. The first is at Junction 16 where additional capacity will be provided, reducing delays by widening the slip road from one to two lanes. The second is at junction 17 where resurfacing and providing an upgrade to the signing and lining on the southbound off-slip will help people use the most appropriate lane and in particular aid those wishing to get to Cribbs Causeway to do so more easily. Between junctions 11 and 12 in Gloucestershire we will install additional roadside signs to improve driver information for those using this section of the M5. This will considerably enhance our ability to relay information to drivers and keep them informed about traffic conditions ahead. In Devon there are two schemes in progress. At junction 27 capacity will be increased and delays reduced by widening the southbound exit slip road from two to three lanes and enhancing the roundabout carriageway to two dedicated lanes. To improve the overall efficiency and improve safety at busy times, part-time motion sensitive traffic signals will be installed to actively manage traffic and keep any queues to a minimum. Finally at junction 30 – near Exeter – additional capacity will be provided by widening the southbound exit slip road from three to four lanes on the approach to the roundabout. On the roundabout, motion sensitive traffic signals are also being installed to actively manage traffic and keep any queues to a minimum, easing congestion and reducing delays.